Songlines was first released by FMP on CD in 1994, and went out of print some years ago before it was made available as a digital download by Destination Out in 2015. Now we have it in a remastered edition on CD and in the Queen of Formats, a double LP, from the Austrian label Trost which has specialised in reissuing Peter Brötzmann’s FMP catalogue on vinyl. 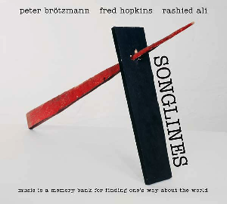 The album was recorded in October 1991 during the Total Music Meeting in Berlin by the trio of Brötzmann (tenor and alto saxophones, tárogató), Fred Hopkins (double bass) and Rashied Ali (drums). At the time it was thought something of an oddity in Brötzmann’s catalogue, showing a more lyrical side which had not been heard much before outside his solo recordings made in the privacy of the studio but which would come to have greater prominence in his work. The popular image of Brötzmann is of an indefatigable figure, out front and blasting away, doing his own thing. Like all clichés, it’s not without foundation. His is a big voice, pungent and explicit, whose music gravitates to the extremes – “I like art where the blood is streaming and the flowers blooming like hell” says Brötzmann – like his compatriot Anselm Kiefer, he’s not much bothered with what goes on in the middle, possibly suggesting an absence of compromise. What might escape attention is Brötzmann’s role as part of a collective however, adjusting his profile and focus, discreetly pushing things in new directions, but as one voice amongst many. The albums under review today and tomorrow show just what an accommodating player he can be. The covers also give us examples of his sculptures – “objects” might be a better description. Hopkins, whom Brötzmann had known for some time, had been a member of the great Air trio with Henry Threadgill and Steve McCall. He’d worked closely with David Murray in his various groups of the Eighties and had formed a sympathetic string duo with Diedre Murray (cello). Classically trained, he had a sonorous tone and an ability to coil sinuous lines around his fellow musicians. Ali, one of the great free jazz drummers, is familiar (less well known is that Brötzmann was particularly fond of playing with his brother, Muhammad Ali, also a drummer). It has been suggested that this album finds Brötzmann in awe of the illustrious American rhythm section, and that he moderated his energy levels out of respect for them, but I’m not sure that gets the dynamics quite right. One senses both Brötzmann and Ali reining themselves in to acclimatise Hopkins, who’s very much centre-stage, physically and musically (compare Ali’s drumming here with his playing on Touchin’ on Trane (FMP, 1993) with Charles Gayle and William Parker, recorded at the same festival). Hopkins’ deeply melodic style would be out of place with his partners’ more Sturm und Drang and “multidirectional” excursions. He had a quieter intensity that invited integration and balance with his bass, requiring more modest and harmonious gestures, and a keen sense of pulse – and Brötzmann has always had a preference for drummers who can swing. Brötzmann is aware of his lineage and regards himself as a jazz musician – he doesn’t even like the term “free jazz” applied to him – and it was with performances like this that his roots became apparent, something not even recognised by Brötzmann in his early years, although he now says he can hear it as far back as his first album, For Adolphe Sax (BRÖ, 1967). Often, the references to older music were slightly self-conscious, with a satirical edge, as if in scare quotes. Brötzmann described his playing of ballads at the time as “a bit clumsy, awkward” yet it’s this very artlessness and lack of veneer which marks them out. I think Brötzmann recognised this and that he could move beyond irony and pastiche (which have no real place in his music) incorporating other kinds of playing without sounding derivative or compromising the expressive authenticity that has always been his central concern. I’m not suggesting Songlines was a turning point – musical development is rarely so clear cut – but it’s a significant marker. The album opens with ‘No Messages’, introduced by Ali’s tuneful drums. It settles into a relaxed groove with a simple melody from Brötzmann, in soft pencil rather than the etched relief that gradually came to characterise his playing. As he builds on the tune moments of intensity are marked by his actually getting quieter. It is typical of the importance which Hopkins gave to musical values, and of the tone of the performances generally, that his solos are not about showing-off – displaying his prodigious technique to earn some applause – but the virtues of developing his material, bringing new features to light. ‘Old man Kangaroo’ is a fierier affair, smudges and smears over tumbling bass and drums. Hopkins uses a chordal phrase as a point of departure and return and Brötzmann’s saxophone traces a modulated arc over the duration of the piece. ‘Man in a Vacuum’ opens with Hopkins’ carefully crafted double stops and slides, lending accent to his phrases. Brötzmann’s blurred flow on fruity tenor rarely strays into the upper registers and the piece winds down with a gradual diminuendo, leaving the soft patter of Ali’s percussion. One can hear Brötzmann and Hopkins finding their way into each other’s idioms. On ‘…It is Solved by Walking’, starting with Brötzmann, they take it in turns to drop in what sounds like a sneaky quote from Ornette’s ‘Una Muy Bonita’, delivered like a punch line. Even Ali chips in during his melodic solo and predictably, they all end on it, though there’s a feeling that Brötzmann is not entirely convinced. He and Hopkins were able to find greater accord in later performances as Hopkins became more familiar with the longer shifts which govern Brötzmann’s improvisations and adapted his supple bass lines to match. Brötzmann shapes according to his own measures, which only make sense cumulatively, and it works best where there’s a regularity of rhythm or texture, allowing his repeated phrases to float. There’s usually not much by way of direct exchange, which would break the continuity when he hits his stride. There is room for an intimate tone and circumscribed gestures when the pace slackens however, and this increased as Brötzmann became comfortable with other, more precise modes of expression, and aware of the dramatic power that simplicity and contrast can bring: his way of articulating the paradoxes which frame the human condition – conflicts and ambiguities which cannot be reconciled, but the recognition of which can make our lives more tolerable. We hear this in ‘Songlines’, the longest piece, which opens and closes with urgent repetitions and is full of nervous energy, pausing for reflective solos for bass and drums. At its still centre lies something transcendent: a plain melody, played by Brötzmann on the tárogató, without decoration save for subtly placed vibrato and the occasional sour tone, shadowed and reinforced by a lullaby-like throbbing from Hopkins. Beauty and sadness are sometimes inseparable. The album concludes with the short ‘Two Birds in a Feather’, an almost complete form of what subsequently became known as Brötzmann’s ‘Master of a Small House’ theme, accompanied by rolling arpeggios on bass and Ali’s stuttering brushes, and includes a lugubrious solo from Hopkins. Brötzmann and Hopkins played as a trio with the drummer Phillip Wilson before the latter’s untimely death (but never recorded) and they got together again in 1998 for a few US dates, with Hamid Drake on drums, the last of which was released as The Atlanta Concert (Okka Disk, 2001). It ends with another elegiac tune on tenor, building to a furious crescendo. By this stage Hopkins was ill, just able to muster sufficient energy to play each night (“he played beautifully” says Brötzmann) and Atlanta was also his last performance. He disappeared a few weeks after the gig and had passed away within six months. Three years later at the Tales out of Time (hatOLOGY, 2004) session, when Brötzmann settled on the now familiar name for the ‘Master of a Small House’ tune, he dedicated it to Hopkins. Are there any advantages in the new (remastered) edition compared with the older release, and how does the older format of LP stand up in comparison to the new release in the newer format of CD? (I hope you’re still with me.) As a recording, Songlines is a slightly mixed bag. Taken from two performances, presumably at different venues, there’s a difference in sound quality. On some tracks it’s clear and open, on others rather muffled with Ali’s cymbals sometimes nothing more than a background haze, probably due to microphone placement. The remastering (not remixing) can’t completely remedy such matters but there’s been an increase in levels and overall gains in clarity and definition. On 180g vinyl, the usual advantages are present: Hopkins’ bass is deeper and firmer, instrumental textures are more vivid and there’s extra sparkle and air in the cymbals. There are also the disadvantages of vinyl: the title track, at just over 25 minutes, is spread over sides three and four and the running order of tracks two to four is different. As regards the even newer format of computer files, Trost’s Bandcamp site allows you to listen to the new edition, but no digital download is available, the right to which remains with Destination Out for the older edition, which is in the same digital format – 44.1/16 (Red Book) – as the old CD. It’s all very simple really. The choice between CD (old or new), vinyl (new) or download (old) is yours but musically, whatever the format, you won’t be disappointed. Excellent review !!! This is a great recording and you nailed this one. This is one of the best releases in a while. Thank you for writing this my friend. I still remember when I received “Songlines“ in 1995, it was in a package with Charles Gayle’s “Touchin’ On Trane“, The Feel Trio’s “Celebrated Blazons“ and King Übü Orchestra’s “Binaurality“. While “Touchin’ on Trane“ immediately killed me (and still does whenever I hear it), King Übü was a constant surprise and The Feel Trio couldn’t quite live up to the marvelous “Looking (Berlin Version“ (one of my all time favorites) but was still great, “Songlines“ somehow disappointed me. I wanted the fire-breathing Brötzmann. But over the years the album grew with every listening, it had a strange attraction, Hopkins and Ali challenged Brötzmann in a very special manner. In the liner notes Steve Lake complains that Brötzmann is not the one to play ballads, that you can see the boundaries of his technique here, and Brötzmann answers that although he is a bit clumsy and awkward, this has its own charm (as you mention it in the review, Colin). Then again, Brötzmann is not as limited as some people think. I remember listening to him at a solo concert with my friend Christoph, a very keen amateur saxophonist, who spoke very highly about a passage he played then. “Songlines“ has been underrated so far, I hope it gets the attention it deserves with this reissue. This is an excellent review, Colin, as usual. I’m sure this blog has such a high reputation among some musicians and listeners because of such contributions. I think I initially bought this because of the presence of Fred Hopkins and never regretted it. I wasn't that big of a Brotz fan at the time, which has obviously changed a huge amount. The big surprise to me was how great Ali's drums were recorded and sounded; maybe the remastered recording is even better (or maybe I stopped paying enough attention once the disc was well underway) as I'll investigate with headphones; but I don't remember that being a problem. Anyway I'm very appreciative of this gem getting another look. And anybody calling PB "limited" should get tuned out PDQ. You know my options on Brotzmann, still keep up the good work.